Our high-density polyurethane signage foam has become the worldwide standard for versatile “green” outdoor sign board. Artist-and environmentally friendly, it clearly outperforms wood in 3-D signage and display manufacturing applications, such as theme park, mall, trade show and movie environments. The material’s ease of machining, uniform surface and infinite finish options support new realms of creativity and craftsmanship. Our polyurethane sign board is impermeable by water and moisture, and able to withstand extreme heat and cold. It does not warp or bow, and when coated, it will not rot or decompose, providing long-lasting durability. General Plastics’ outdoor foam sign has a fine cell structure that ensures excellent edge definition. It allows for easy finishing and painting with nearly any coating system. It can also be bonded using a wide variety of adhesive systems to add thickness or to make larger-size HDU (high density urethane) foam signs. Whether carved, routed, sandblasted or machined, our polyurethane sign board is ideal wherever a uniform, grain-free, long-lasting and dimensionally stable material is desired. Discover the most reliable and enduring outdoor sign board on the market. 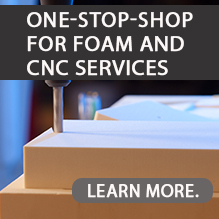 In the United States and Canada, all signage foam is sold exclusively under the trade name Sign•Foam. For additional sales information or to locate a distributor on our sign-related products, please contact Sign-Arts Products, Corp. In Europe, please contact Indasol. In India, please contact Polymer Technologies.